3 Questions related to building a Digital Enterprise! We believe every organization in every industry needs an evaluation of its digital foray. It’s a myth that only certain industries are embracing digital and all others can continue with traditional ways of doing business. It’s the right time for an evaluation and creating a fitting digital strategy. Embracing digital and undertaking transformation requires enterprises to change. The change is not simply supeficial but also at the deeper levels. We have identified 3 essential questions, based upon the 7 aspects of market, strategy, capabilities, boundaries, leadership, culture, and technololgy. 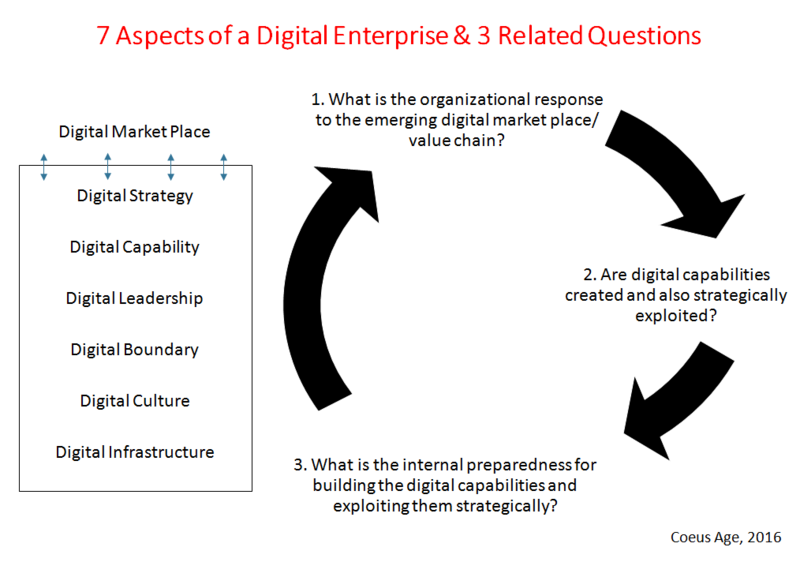 The enterprise leadership needs to evaluate the organization using the 3 questions before undertaking any meaningful digital journey. We present a brief description of an assessment framework to do so. The framework is built upon integrating three important aspects- the external market synch, the capabilities and their exploitation and the internal readiness. Let’s understand each of these three aspects. Digital onslaught can come in various forms, many a time in small ways but with hidden dangers of becoming big. Are you aware of what’s happening in your industry and in the market place? There are three broad ways in which challenge may manifest. – Known competitors may be adopting digital to enhance their market reach or their capability to produce next gen quality products or becoming more efficient in carrying out operations. Each one of them is a potential challenge for you. – Unknown competition from other industries may be extracting a higher share of the consumers’ wallet. E.g. DTH is foraying into areas, which are a direct competition to other entertainment options like movies and game arenas. – New forms of supply and distribution intermediaries emerging, challenging the market power of the traditional players. They may provide better products, superior services and compete on cost. An organization cannot become digital for the sake of it. The specifics in terms of how much, why and how should ideally be determined by assessing what capabilities the organization needs to compete and how should digital help build or exploit those capabilities. A digital capability is not just about technology (though technology is an integral part of it), but about the organizational processes and people competencies, which can be leveraged strategically and exploited for competitive advantage. These organizational processes may already exist and be converted into capabilities by technology or newer processes can be created with the help of technology. In both the cases organizational capabilities, which are required to compete can be created and exploited. The question how much digital to go and in what areas to focus should ideally be answered by an assessment of what specific capabilities are existing and must be exploited (or new capabilities must be built and exploited). Once an assessment of the synch with the market place and the capabilities and their exploitation, the internal readiness must be assessed. The internal assessment is not absolute but relative to what specific capabilities have been identified.